This above diagram represents the 4 mindsets that I can choose to operate from at any time. 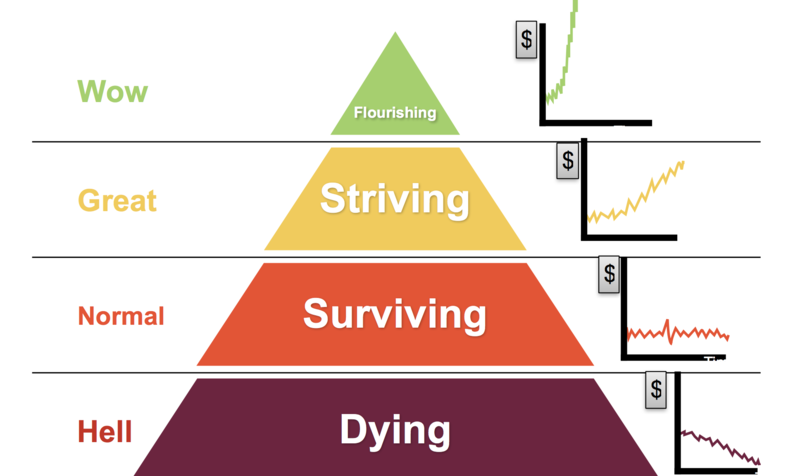 Each mindset has a corresponding habitual cash flow pattern. My default mindset is "Flourishing". Despite my experiences and my perception of reality, I was originally designed to operate from the “Flourishing” mindset. I may have chosen to forget that, I can choose to change my mindset at any instant. The longer I choose to stay in my chosen lower mindsets, (Striving, Surviving, and Dying) then the more I am choosing to become ADDICTED to staying in those mindsets. The longer I choose to stay in my chosen lower mindsets, then the more difficult I am choosing to make it for me and others to leave that mindset. The longer I choose to stay in my chosen lower mindsets, then the more I am willfully choosing to share and perpetuate that mindset with others in the world. I can choose to escape from "the trap of normality" , and choose to return to my original “Flourishing State Of Mastery”, by consciously and willfully choosing to invest my $time, $energy, and $currency, in advanced Mastery Performance Activation practices that can assist me to accelerate the manifestation of my experience of "Heaven here on Earth".